Anyone know if this can be used directly hooked up to a Spectacle Button Board? Like could it be used as a button? Or does it need more than that? Thanks! Unfortunately it won't work. This has a variable resistance and can have one of many values. A button only has 2 states (the 2 sides are connected or they aren't). Judging from the limitations noted by the commentators below, the sensor sounds like it's intended for use as some sort of toy, not for professional measurement applications. I haven't looked yet, but maybe there are higher quality models out there. Probably more expensive, though. 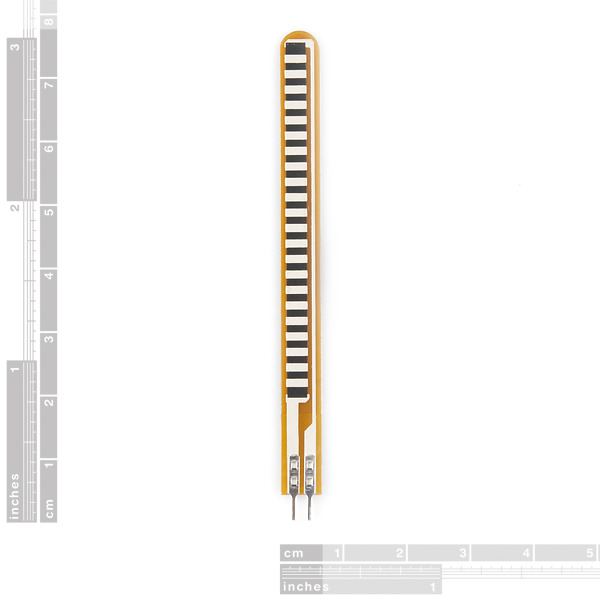 Would sensitivity and dynamic range improve if the sensor were employed as one leg of a bridge circuit, with variable resistor on the opposite leg? The latter can be used to set the zero-point resistance. Can't we improve the sensitivity and range even more by connecting a differential op-amp with high common-mode rejection (i.e., so-called 'instrumentation amp' ) between the 2 legs of the circuit ? 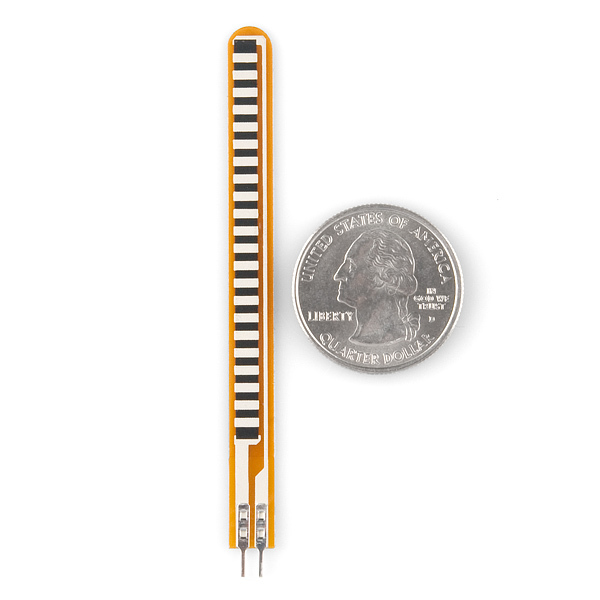 This is a common way of measuring other commonly used resistive sensors. Of course, you eventually will run into the sensor's absolute lower limits of sensitivity, accuracy and noise. Hmmm, the datasheet says 25K to 125K ohms, the Quickstart says 30K to 50K, the Oomlaut Project says 10K to 35K and the one I got is 18.5K to 21.5K and not very consistent. It doesn't seem to be a very reliable component. The newbiehack video says you will get from 25kOhms to "as much as" 125kOhms. Yet another example of sly ad copy. What's the story on the stiff backing (seen in the 3rd product picture)? Is it mean to be peeled off so this can adhere to a substrate? That's what it looks like, but I had some older models lying around which don't have this backing and they are much more flexible. Just wondering if anybody else had noticed this. I recently bought 10 of these sensors for a project, and after testing all of them with my meter, I only got a reading between about 30kÎ© and 35kÎ©. This range is going to be very hard to work with for the project. 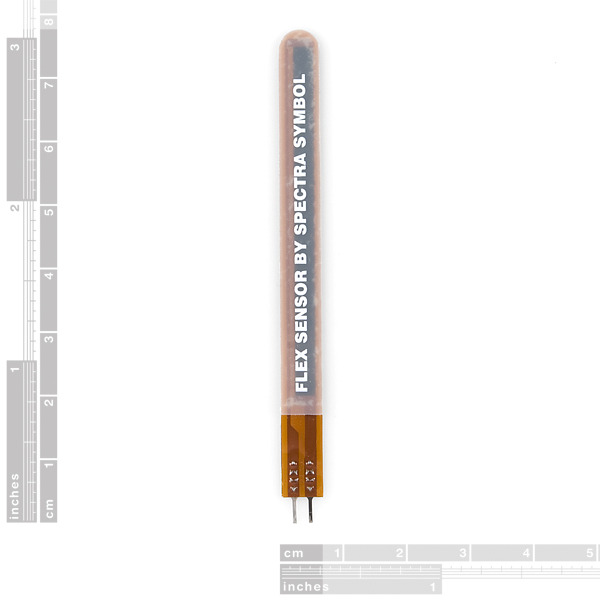 Has anyone else been able to reach the alleged 50kÎ© of resistance with these sensors? I have tried flexing in many different manners with all 10 of the sensors, but haven't come anywhere close to 50kÎ©. It seems very unlikely that I would have gotten 10 defective sensors, so I must conclude that these sensors have some rudimentary design flaw. Not according to the Newbiehack video tutorial. It only changes resistance when flexed in one direction. Hello, are sent to Argentina? the cost is in dollars? thanks, sorry for the ignorance, I'm new. Check out our FAQs. This should answer most of your questions! Hi, can this sensor be flexed of 180 degrees without taking damages? At 180 degrees, you are going to be bending the sensor at the base, which will have a negative affect on the functionality of the sensor and may damage it, so I wouldn't suggest it. Good sensor but would be better if they all come in at the same resting value. You have to be careful soldering wires to them , Just solder to the tabs that stick out, from the sensor, otherwise they have a tendency to go open circuit. Cool product. I was just going to make a videogame controller glove, and I though flex sensors would work best. It's funny to see it's already been done in the exact way I had planned my own project! Any component that undergoes routine physical contact should have some sort of strain relief E.G., Phono plugs, power cables that traverse casing walls, Piezo Vibration Sensor sku: SEN-09196, etc. Yep, exactly. It is up to you to provide your own strain relief. This product does include strain relief, however it does leave an area between the connector and the sensor vulnerable. Again, not something a hobbyist would expect in something labeled "flex sensor". Reading the number of commends around the 'net plenty of other people have had the same issue and ruined their otherwise excellent sensors as a result. Seemed fair to provide a warning here. It's -not- a warning to avoid the sensors (quite the opposite) but to take extra care when using them. Most devices out on the market, excluding external connectors (phono plugs etc...), will not come with any type of strain relief as the assumption by the components manufacturer is that it (the component) is being sold in bulk to a OEM (original equipment manufacturer) who will engineer the casing and any strain relief necessary to keep the end user from destroying the device under normal use. The spec diagrams show both a part length and an active length. The active length does have some reinforcing but it is not an actual strain relief. The strain relief design, as hinted at above, is usually use specific and will vary due to application, casing and physical electrical connection. You sometimes learn such things in design classes. In this case the reinforcing should be clamped to some part of the case the PCB is mounted in. Rule of thumb, take a long look at any device that will move or be manipulated by the end user. Look for the weak link in its design, then look for ways to brace/connect it to the casing or PCB other than its electrical connections. "Normal use" is one of those fine print lawyer words. Fair enough. But at the same time, we've sold thousands of these and only a handful of issues. But, yes, they can be fragile if used in certain circumstances. Right above the solder tabs, the very flexible base bends everytime the flex sensor is bent I.E. leading to high probability of it breaking. Apart from that its good. I got the sensor and perform the corresponding test. all in prefect condition. thank you. I thought I might need some special OpAmp circuit to get a decent range of readings from this. It turned out that my DMM set on reading resistance was more than adequate. The flex sensor worked well, but in my opinion both the sensor and the shipping was too expensive. About 11 dolars for a small sensor is too much. I Think it is to fragile and the electrodes is to small, and it is to easy to damage it Beyond repair. Sorry to hear about the issues with the flex sensor. Have you contacted our technical support department @ techsupport@sparkfun.com about this issue? They may be able to help outline use cases that show what uses we have found these effective in and help find a way to use them without easily damaging them. I'm using this in a MIDI controller glove and it has been working great. I'm getting resistance values ranging from 30kohm to 130kohm! As others have mentioned, it's a good idea to secure the base onto something inflexible as that part isn't really intended to bend. I purchased these sensors for a robotic hand project and the work perfectly, but they are a little bit expensive. surprisingly sensitive. Iâve been trying to sense movements in a solar collector with strain gauges. 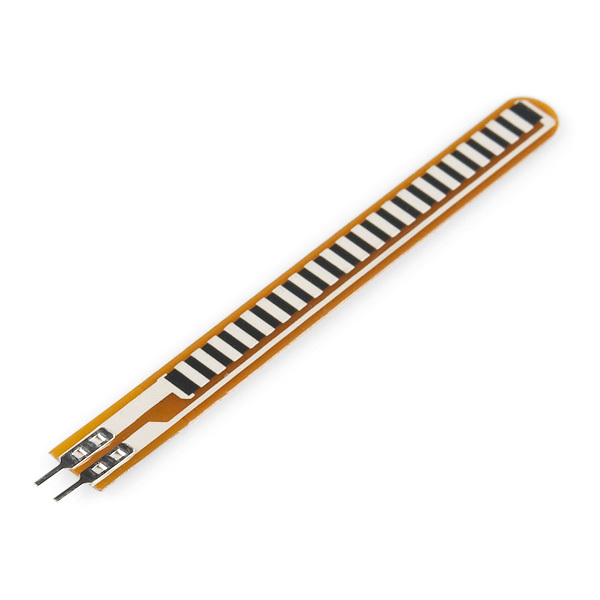 Whereas a strain gauge is far more stable and repeatable, this sensor changes value when flexed and needs little or no amplification for a detectable signal. I see why they are used in gaming gloves. Great flex sensor - can detect both directions! Flex sensor is very responsive one way, and also has some sensitivity (going down to about 22kohms) when flexing backwards. Quite handy! The leads are very thin! !